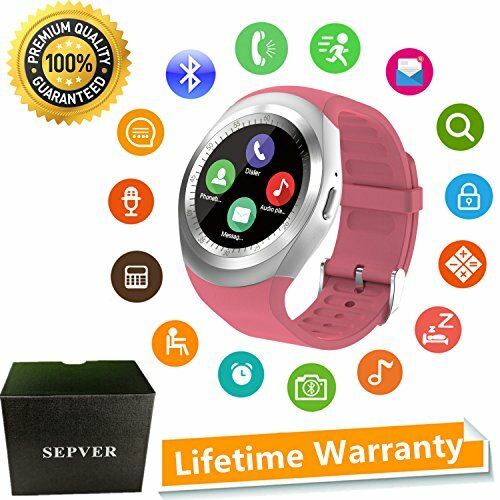 - Use As An Independent Phone - You can use the smart watch to make calls and send text messages like a mobile phone, but you need to insert a GSM SIM card to the watch first. No need to pair with a mobile phone. - Work With A Mobile Phone: You can use this smart watch to check your updates, receive texts, messages and notifications of APPs (such as Facebook, Twitter, Wechat, Whatsapp). Make and answer calls by the smartwatch without taking out your phone from the pocket, and no need to insert a SIM card into the smart watch. - Maximum Compatibility - Compatible with all Android Phone & IOS phone, such as Apple, Samsung, Google, HTC, Sony, LG, Huawei, ZTE, Oppo, Xiomi, Lenovo etc. All features work with Android phones, partial features work with iPhone. - Main Functions - Make calls / Answer calls, receive messages / send messages, push notifications, pedometer, sleep monitoring, sedentary remind, Image viewer, Audio player, Remote capture, Alarm, Two way Anti-lost, Phone book, calendar, calculator, world clock. - HD Display - Full round screen smart watch, high sensitive touch screen. 1 year quality warranty and 24 hours email service.